The International Business Festival drew to a close last week with the Health and Life Sciences, Creative Industries and Sport, Culture and Travel themed days. Watch the IBF week three round up here. The Health and Life Sciences theme closely aligns with the University’s research on personalised health and infectious diseases, as well as the work of the Faculty itself. Members from the Centre for Global Vaccine Research were on hand at the Festival to discuss the considerable capabilities the University has in this area. The University was also involved in the Liverpool Health Partners series of round table discussions ‘Health is Wealth’ and in profiling CEIDR (Centre of Excellence for Infectious Diseases Research) with colleagues from the Liverpool School of Tropical Medicine. The 2018 International Business Festival has been all about arming people with the tools to overcome challenges, enabling them to build relationships and see new sides to people, places and products. On Creative Industries day the University’s Professor Katie Atkinson, Head of the Department of Computer Science, was part of the Futures Stage discussion ‘It’s all about the talent’, which considered the continued growth in tech employment and outlined the IT skills that companies will need to recruit in the future. Getting creative, the Centre of Architecture and the Visual Arts (CAVA) showcased their AI and VR projects including the immersive visitor experience created for the St George’s Hall, which was created using HoloLens technology. Finally the Sport, Culture and Travel day examined the remarkable ability of industries who put places on the map, exploring how they can turn around a place’s fortunes and shine a global spotlight, like no other sector can. The University’s Business Gateway managers showcased recent work on the creation of new programmes, services and research within the University’s Heritage and Digital research themes that relates to the arts, culture and tourism sector. 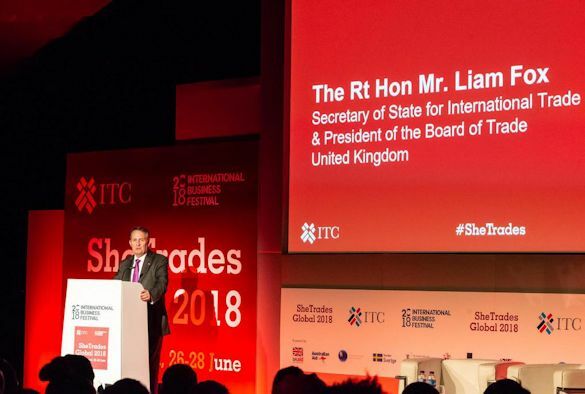 International Trade Secretary Dr Liam Fox closed the final day of the event saying the Festival had ‘focused the attention of the global business community on the opportunities here in the UK.’ Read more here. For more information about future industry-facing events please contact bgevents@liverpool.ac.uk.